Side table. Concrete, gravel-stone, smoked glass, metal and gold flake lacquer. Memories of bumper cars and frites with plenty of mayonaise. 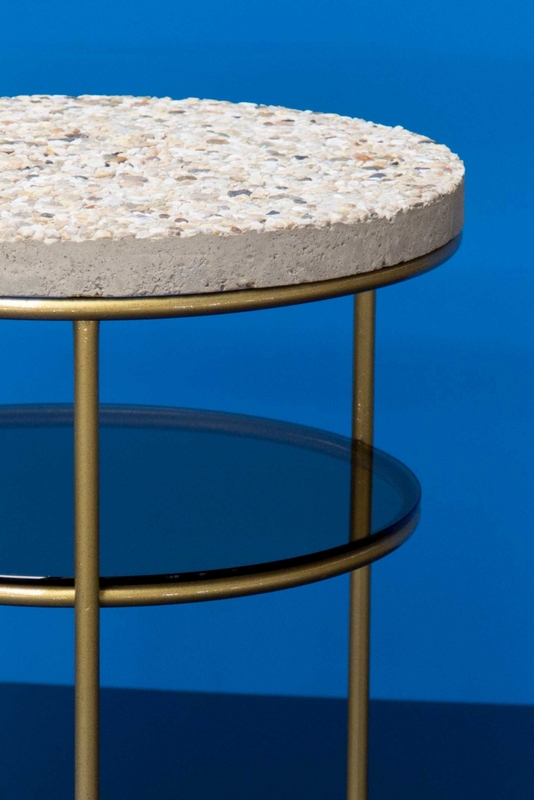 For this side table Bart Joachim brought together materials well known by the ones who grew up in a Dutch small town. Rainy summers and fun fairs. Concrete gravel tiles, cheap and populair in the seventies, now associated with neglected backyards, low life and cheap entertainment. To celebrate these materials and in an attempt to slightly bend their strong social connotations, Bart Joachim molded them into a form of class and luxury.